Will an 18-storey complex on the River Clyde get planning permission? 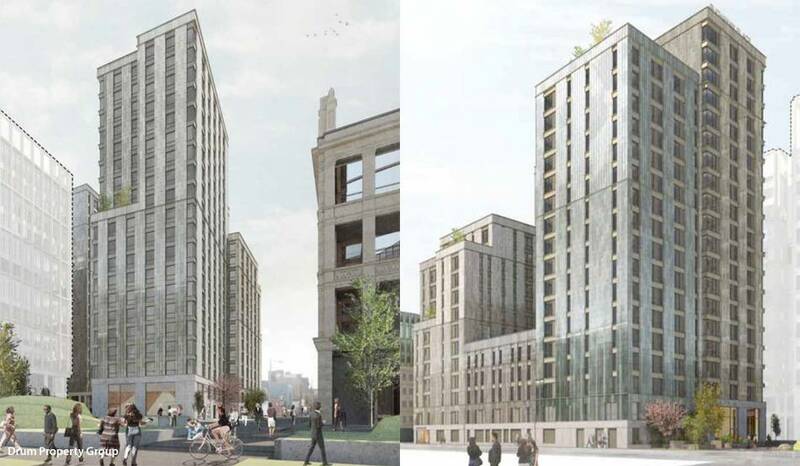 I will await with interest the outcome of a planning application for an 18-storey build-to-rent complex at the Buchanan Wharf development near River Clyde close to Glasgow city centre. The development of 324 flats would sit at the corner of Kingston Street and Commerce Street, in the south east corner of the Tradeston site. Documents submitted by architects Stallan-Brand state the building, with two 18-floor towers, “will play a key role in Glasgow’s skyline, in particular when entering the city from the south”. This seems to me to be a shocking plan for the area, and I hope it goes the way of most such ridiculously high developments – and gets thrown out. A look at the surrounding area shows that the proposed towers are about TWICE the height of most the existing building in the surrounding area. It’s been pointed out in the past that some developers seem to determined to virtually cut off public access and public view to the river front, and create a nice little closed environment for their tenants. Those that can afford to get to the river can enjoy it, while the rest of us end up being excluded, not only from access, but even most of the view. There was one positive line. There will be 324 secure cycle parking spaces. A ground floor car park will have 16 spaces. I wonder how that will go down with the planning department? Do the proposers really think there will be a mere 16 car owners living there? Or is it more likely some 300 cars will somehow ‘vanish’ into the surrounding streets? How about friends and visitors? Do they fold up their cars and stick them in their back pocket if they decide to visit? An unplanned trip to Braehead brought an unexpectedly quick sample of a lifebelt with rope attached, as mentioned in yesterday’s post about the council acting to update such installations, following loss of life where lifebelts could not be retrieved and thrown again if they were not thrown near enough to persons in difficulty, and drifted away. It’s years since I last visited Breahead – when Clydebuilt closed (museum opened from 1999 – 2010, but I don’t know when I last dropped in there), I had no real reason to go there as there’s not really anything else there that I can’t find closer to home. Going only from memory, the shopping centre seems to be less impressive than it was when I there all those years ago, and changed too. I’m sure I remember ramps and underground car parking, which I didn’t seem to see, but I wasn’t driving this time. On the other hand, now I know how to get there easily (via public transport, so I can carry stuff), it could be handy, as there are a few (big) shops there that seem to hold different stock ranges compared to those nearer to me. I’ve featured the lifebelts that can be found along the River Clyde a few times, but mainly just as interesting features, rather than for anything to do with their true purpose. While this one was more light-hearted: Would you rather drown or be electrocuted? On the whole, I don’t see the lifebelts being vandalised much in the spots where I walk (but assume some are regularly abused in some areas), and was pleased to see those bright markers appearing, making it easy for anyone to identify the spot where they may have to contact emergency services if one is used. It can be hard to give a location anywhere along the river, if it’s not in a built up area. A couple whose son died after he fell into the River Clyde have welcomed the installation of rescue ropes to lifebelts along the water’s edge. Christopher Spiers, 28, fell into the water in Glasgow city centre after a night out in January 2016. Although police were able to throw in a lifebelt, there were no ropes to have another go when it did not reach him. His parents Duncan and Margaret have been campaigning to improve safety along the river. Mr and Mrs Spiers launched a campaign to get ropes put on lifebelts so there could be repeated attempts to throw them. Glasgow City Council has announced an action plan on river safety and has started to attach ropes to lifebelts. It also pledge to improve signage warning of the danger of deep, cold water. Mr Spiers said he wanted MSPs at Holyrood to extend this to all Scotland’s waterways. Our lovely see-saw weather, and a change in normal routes followed means I haven’t been near many lifebelt sites, or seen any with ropes attached, but I will be watching for them, and add a pic to the blog when I do. This pic accompanied the article, and appears to show one such installation near the Kingston Bridge. As somebody who spent a fair few hours of their working life wandering the various shipyards and businesses that once lay along the River Clyde to the west of the city centre, it’s funny to look at how deserted that same area has become in recent years. Not only have many of those varied business gone, many of the sites they occupied have also been razed and cleared, leaving little to show where they once lay. This would have been hard to see clearly from the ground, but thanks to tools such as Google Earth, it’s possible for anyone to ‘fly’ over all these places today, and compare them to the past. Some parts have been regenerated or redeveloped with housing and other features, but a wander along the river shows that there’s probably more deserted area than reused now, and that many of the formerly occupied sites remain derelict today. There are some ‘backward looking’ nostalgic types who keep calling for shipyards to be planted on the Clyde, but that’s never going to happen with our wages and costs. Those people notably fail to reveal how to finance such yards, or who would but the hugely expensive ships built in them. Fortunately, there are a few who can look forward rather than backwards, and plans for redeveloping and regenerating these areas are dependent on looking at change. Despite flooding concerns, plans to regenerate the River Clyde are moving forward. The Glasgow Strategic Development Framework (SDF) has been set up to create houses and transform isolated visitor destinations along the river by 2050. A proposal has identified an approach that would make areas from Govan to Glasgow Harbour more accessible by linking them via a footbridge. Those involved in the project want to achieve a sheltered water or habitat for wildlife and uncover hidden gems within forgotten parts of the city by linking Govan and Partick by building a bridge. Those working on the framework have been in conversation with SEPA to ensure flooding can be prevented along the river and allow the project to continue. Michael Ward of the Glasgow SDF told the Hillhead partnership: “There is a flooding issue and we are engaging with SEPA to see how this can be resolved. “We are aware of the implications if the river rises by one metre or more. We need to conduct a feasibility study. “We see this as a long-term vision for the area. There is a lot of potential for the river and we need to maximise that. It is hoped that by constructing a footbridge, visitors will be more likely to visit Govan and its historical assets. A couple of items jumped out of these proposals, for me at least. I found that slightly amusing, given how the bridges ALREADY added to the river in recent years have significantly reduced access. But that doesn’t mean ignoring such access, which the planners clearly are NOT forgetting. Easily dealt with just ensuring Climate Change Deniers are selected for this development, then things can proceed without worrying about rising water levels. Let’s never forget problems are there to be solved – there used to be a yard building ships upriver of the Clyde Tidal Weir. And they were so big the only way to get them over the weir was to pick the right time and tide, and float them over. Planners go to chip shop – get reheats! I wonder if I am the only person who has noticed that a draft proposal seen today is perhaps inspired by something we saw eight years ago, way back in 2011? A DRAFT blueprint for regeneration around the Clyde in Glasgow proposes allowing development of hotel, restaurant and residential structures on the water itself. The possibility of semi-permanent floatingng structures/floating architecture is raised in Glasgow City Council’s River Clyde Corridor Strategic Development Framework (SDF), which is currently the subject of consultation. I have to admit to having had a bit of fun with the proposal back then, and there never seemed to be any follow-up or progress to suggest otherwise. Plans have been unveiled for a £30m floating leisure village on the south bank of the River Clyde in Glasgow. Under the proposal, a u-shaped floating road would be built at Canting Basin, which is part of Prince’s Dock at the back of the city’s Science Centre. This would lead to a mix of office buildings, studio flats and town houses with their own private moorings. If planning permission is granted and private funding can be found the complex could be in place by 2015. Floating Concepts chief executive, David Beard, said: “All great coastal cities have a prime waterfront destination and now Glasgow has the chance to join those ranks. The firm will now approach Glasgow City Council with a view to submitting an outline planning application. If this is granted, and private finance for the deal can be found, work could start by the summer of 2012, with completion in two to three years. This time around, the plans have a 30-year time scale, not 3! However, it will be interesting to see if there is any sort of further progress with the idea past the proposal stage, or if this revival goes the same way as most reheats. The difference is obvious, being a city/council initiative with a wider plan, rather than a private development. It’s a pity the place I had some long discussion over various wartime relics found in Scotland isn’t really available now, since the original find and recovery of this ‘Little Ship’ was quite extended. The good news is that it is to be restored and turned into a floating museum. It had been used for cruises on Loch Lomond, for something like 30 years, but eventually fell into disrepair, and sank. A few years ago, it was raised by the Royal Navy after a campaign to rescue/recover it, by veterans supporting the Skylark IX Recovery Trust, and was moved to the Scottish Maritime Museum, Irvine. A Dunkirk Little Ship, which rescued 600 Allied troops during World War Two, is to be restored and turned into a floating museum on the River Clyde. Skylark IX will be saved thanks to £404,000 of funding from The National Lottery. The work will be carried out by a specialist boatbuilding team working with recovering drug addicts. The boat, built as a passenger cruiser in 1927, become part of the Dunkirk Little Ships fleet of 850 boats. After seeing the story about the restoration work set to be carried out on the West Boathouse on the River Clyde, after thinking it might have been derelict, I thought I should really take a chance and try for some pics before anything changed. This place is long (or wide, depending on how your brain is wired), so there’s no way to get a shot without something expensive, or you have to stitch multiple shots together. I’ll let you guess what I do. Yes, it was late, not dark, just dusk – I’m surprised this came out so well, even with the low contrast. There’s no problem if you’re far away, so I reshot the night shot from the previous post. Then wandered along for a view from the opposite bank. Again, no problem with the length of the building. Note the shoring on the left. And the other – that shoring has been there for years. Another reason for thinking ‘derelict’. I don’t know if the crazy angle of the boathouse in this pic is down to me, or if it really has subsided to that extent. But, look at the fence, and the edge of the other building caught in this pic. Not a bad catch, but for the dusk, lack of contrast, and little colour. I have to confess that, until recently, I thought an old boathouse on Glasgow Green was maybe derelict. I’ve never seen it in use, or even open, due to the usual times I was down that way, and it was only a few weeks ago that I saw it with a door lying open, and people moving around inside. 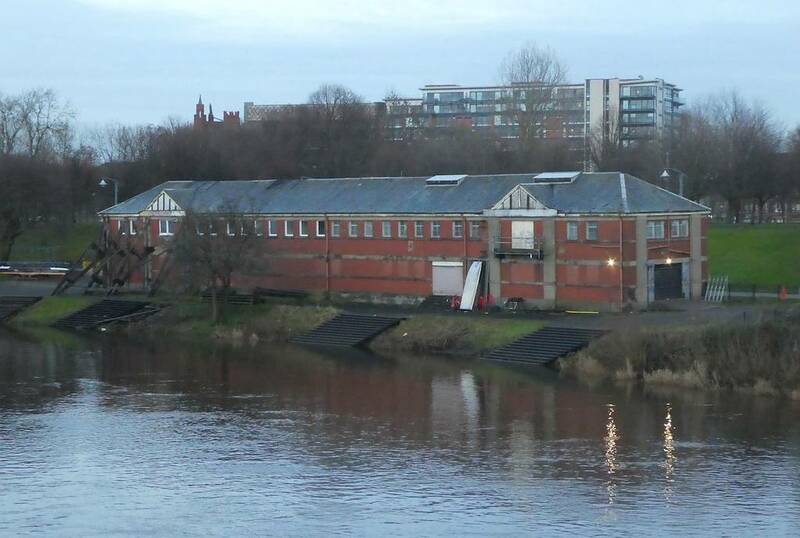 In fact, plans have just been approved for a new 99-year lease to the Clydesdale and Clyde Amateur Rowing Clubs for use the West Boathouse and surrounding land. Under the terms of the agreement, the clubs will pay £750-a-year between them for the site following the completion of the £2.8m redevelopment. 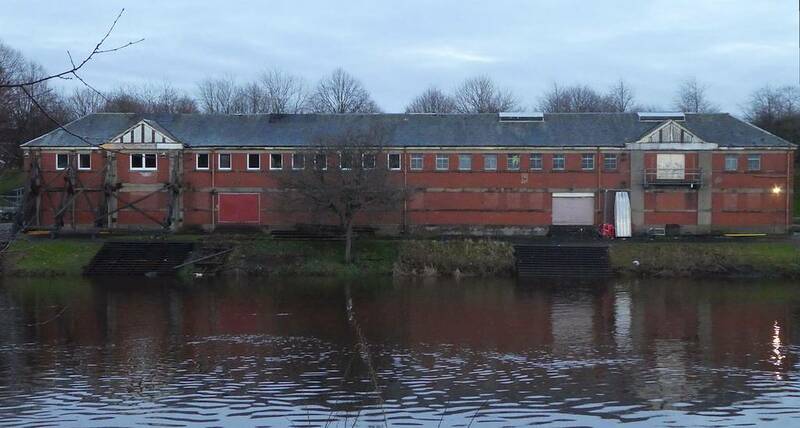 That work will be carried out by the Glasgow Building Preservation Trust (GBPT) who are set to install new changing facilities, lift access, multi-use spaces and a floating pontoon from next year. The boathouse is a category B-listed building which sits in Glasgow Green and was built for the use of both rowing clubs in 1905. As part of the work, the Trust will take over an area of Glasgow Green, which is not currently leased by the clubs, for a trailer park, rowing racks and an access route to pontoons. The boathouse building will be redeveloped from a semi-detached unit into a fully shared space by 2020. Both clubs have been paying £350-a-year since 1990 for use of the site but the new agreement will allow the council to transfer liability for maintenance and management of the building to the clubs. Pity I didn’t take a pic or two of some rowers I thought were mad to be out on the water a few days ago, when it was almost freezing – I like my playing to be fun. I didn’t think I had any pics of the place, although I know I have some really old ones (on film) that show the place looking much as it does today, and in need of restoration, especially the area leading to the river. I think this was used for a shooting scene in ‘Taggart’. I remembered I’d fired off some test shots on 05 November, while waiting for the fireworks on Glasgow Green to start. The first one was just one of my habitual hand-held low light night shots, I can’t resist, even it was not the plan for that night. But, I still needed to have an idea of what area I could cover when I changed over to long exposures. After playing around a bit, and finding a way to support the camera (exposures were going up to around 8 seconds), I began to get half decent results. And then there were interesting shots. This one caught an early firework release, but the actual interest will be spotted in the bright lights. Note now they have developed ‘drops’ which appear to run down from them, as the camera was moved too soon, at the end of the shot, before the shutter had closed. One to remember for later use. Interestingly, the lit windows of the building behind (Templeton’s), although appearing to be bright, were not bright enough to ‘drop’ or streak in the same way.